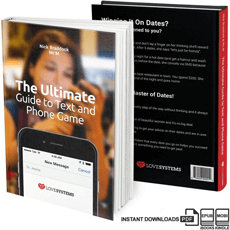 "It's A Great Book and A Must Have For Any Serious PUA"
I just finished reading the ultimate guide to text and phone game by braddock and mr m yesterday, and it already is a great addition to my game. My game was already pretty good but my phone and text game needed some serious work. I'd number close a lot of girls but most of them would flake, except the ones I already build lots of comfort with. Thanks to braddock I now have the skillset to turn most phone numbers into dates, even girls I only spoke to for 5 minutes. I can honestly say it's a great book and a must have for any serious PUA.